Be they the world’s premier auto shows, giant theme parks, or major business events, today’s high-end users of uber-large video displays are demanding more pixels than ever before. These users want to play out stunning visual content at resolutions as high as 8K (7680×4320 pixels) if possible. If not, then a mix of 4K (3840×2160 pixels) video streams will do. Before selecting a media server or family of media servers, determine your own playout needs. Will you need multiple 4K channels? Is 8K on the horizon? Then buy media services that will have enough ‘headroom’ for their expected operational lifespans with your company. A media server’s hardware is only as good as the software that operates it. Quiz each vendor as to the capabilities of each; how their hardware and software interact on their media server platforms, and what their upgrade/support plans are. A modern media server needs lots of processing power to serve 8K and 8K video streams reliably; with no hesitations or dropouts. Get as much CPU capacity as you can afford, and make sure that your system supports the highest-possible data rates. The catch: “Whether in 8K or 4K, these video streams need to be uncompressed to fill giant screens with as much detail as they can,” said Danny Whetstone; founder and president of the production house DWP Live in Nashville, TN. “Compressed video may look good on a 70" display, but it won’t cut it on a massive video wall,” he said. Serving such massive pixel playouts requires one or more media servers with the sheer processing power, gigantic hard drive capacity, and rock-solid reliability to keep these playouts running without interruption 24/7. One such super-powered media server exists; namely AV Stumpfl’s powerful 8K Wings Engine RAW media server. Add the ruggedness to play this demanding level of uncompressed content on a continuous basis, and AV Stumpfl’s 8K Wings Engine RAW media server is a highly capable option for 8K/4K video playout. To prove this fact, DWP Live has teamed with AV Stumpfl USA to provide side-by-side comparisons of uncompressed vs. compressed playout at InfoComm 2017. It is scheduled to be held June 14-16, 2017 at the Orange County Convention Center in Orlando, FL. 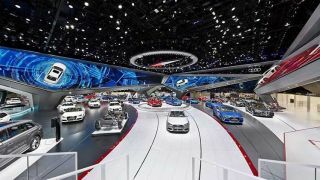 A detailed look at how 8K Wings Engine RAW servers drove Audi’s gigantic video display at the 2015 IAA International Motor Show. AV Stumpfl’s product page describing the 8K Wings Engine RAW media server.